By James L. Fleming, M.D. This year on Veteran’s Day, I would like to suggest that each of us thinks about how we can better support those who have served in the United States Arm Forces. Many people in society provide valuable service to their community and country but few occupations require the possibility of losing life and limb as do members of the military, Given this unique role in society, it’s only fitting that we set aside a special day to remember them. Thanking a veteran for their service is certainly an easy thing to do and probably appreciated, but from the perspective of a mental health professional, I think we need to do more. As many readers are aware, the wars in Iraq and Afghanistan have taken a toll on the military and on its members and their families. This has been reflected in the alarming of rate of suicide among veterans, 20 per day according to Veteran’s Administration (VA) study. Some vets “fly under the radar”, i.e. don’t talk about their time in the service and may even avoid seeking help, even at a VA hospital or Vet Center. We have to assume that these men and women have reasons for this and we may never learn why, but we need to respect their right to privacy and autonomy. On the other hand if we notice warning signs like depressed or irritable mood, or episodes of anxiety or substance abuse, we may want reach out to them and express concern. Or perhaps, we know a family member or friend we could check in with about our concerns. Due to extensive media reports in recent years, most people are familiar with the concept of Post Traumatic Stress Disorder (PTSD) and know that it occurs in some but not all people after exposure to traumatic events. While the problem is not unique to military personnel, combat veterans suffer from this condition at a high rate and the effects can often be delayed as well as chronic and in some cases, disabling. Complicating the situation is the sense of stigma associated with seeking help and traditionally this tends to be heightened in military settings due to inaccurate perceptions that only the “weak” succumb to mental problems. Fortunately, the military and the VA have made great strides in overcoming stigma but it still exerts an adverse impact and can dissuade some individuals from seeking help. We don’t have to know much about these conditions and we don’t have to try to act as a “counselor”; rather just letting someone know you care can make a huge difference—in fact, its the sense that no cares or notices that often leads to intensification of loneliness and desperation. We can also become familiar with local and regional resources for medical and mental health services as well as various forms of support for veterans and some of these are listed below. One resource which, for the past 3 years I have had the honor of participating in, is Team Red, White and Blue (www.teamrwb.org), an organization started by veterans but open to both veterans and non-veteran civilians. 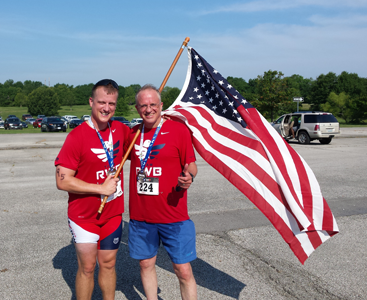 Team RWB’s mission is to “enrich the lives of America’s veterans by connecting them to their community through physical and social activity”. This includes 5K, 10K and longer road or trail races, as well as biking, swimming, yoga and pilates. Anyone who has been to some of these in the Kansas City or Omaha area will recognize Team RWB’s bright red “Eagle” T-shirts (see photo). A lot of very supportive socialization occurs at the running events but social events also include shared meals, picnics, and other get-togethers as well as a Facebook page which frankly is so active it’s hard to keep up with! For more info on the Kansas City Chapter contact Susan at: kansascity@teamrwb.org and for the Omaha Chapter contact Robbin at: robbin.alex@teamrwb.org. So this year on Veteran’s Day, I hope everyone not only remembers our vets but also looks for concrete ways in which they can be a supportive, caring presence for those who have risked so much for our country. 2. National Call Center for Homeless Veterans 877- 424- 3838. The U.S Department of Veterans Affairs also has a PTSD Coach Online which provides tools to help manage stress. Dr Fleming is Medical Director of Senior Life Solutions, an intensive outpatient program for seniors at Community Hospital - Fairfax. For more information contact Program Director Gail Heitman at 660-686-2319.